The Eating Disorders Care and Assessment Team is a multidisciplinary group of clinicians from both the Counseling Center and Health Services. Having an interdisciplinary team allows us to support different aspects of a students’ recovery from their eating disorders. Our team meets weekly to discuss students’ treatment progress, and to ensure continuity of care. 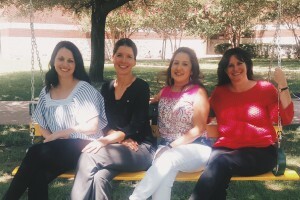 The Eating Disorders Care and Assessment Team often collaborates with other campus partners, as well as with mental health and medical professionals in Waco. Sara is a Psychiatric Nurse Practitioner who is married to a Baylor Alumni and has 2 children ages 5 and 7. Mrs. Addison and her family relocated here from Wylie, TX (North Dallas Suburb) in June. She grew up in The Woodlands, TX and attended UMass Amherst for Bachelor’s of Science in Nursing and UT Arlington for Master’s of Science in Nursing. Lisa MacMaster graduated from Baylor University with a Bachelor of Science in Education in 1989 and a Bachelor of Science in Nursing in 1991. Following graduation, Lisa worked as a Registered Nurse for over 10 years in areas including liver transplantation, pediatrics, home health, family practice, and cardiology. Lisa received a Master of Science degree from Texas Woman’s University Houston branch, and she is certified by the American Academy of Nurse Practitioners with prescriptive authority privileges in Texas. Lisa completed an adolescent health care fellowship through Baylor College of Medicine at Texas Children’s Hospital in Houston where she worked with eating disorder patients on a multidisciplinary team. She has experience working on the Body IQ work team here at Baylor and has participated in numerous specialized trainings in eating disorder assessment and management. She has a passion for working with our students who struggle with an eating disorder and is currently a part of the Eating Disorder Care and Assessment interdisciplinary team here at Baylor University. Regina has been a registered and licensed dietitian for 23 years by the Academy of Nutrition and Dietetics. She received her education at Baylor University and Texas Woman’s University. She completed her dietetic internship at the Houston Veterans Affairs Medical Center. Her interest in working with the treatment of eating disorders began in 2008. Over the last ten years, Regina has regularly attended the annual conferences of the International Association for Eating Disorder Professionals, Renfrew, and the National Eating Disorder Association. She has also completed training via the Eating Disorder Boot Camp, Reflections Body Image Academy, and over 100 hours of continuing education specific to the treatment of eating disorders. Regina is a member of the International Federation of Eating Disorder Dietitians as well as Eating Disorder Registered Dietitian Professionals. Regina believes in a non-diet, weight neutral treatment approach. She can help clients develop a personalized eating plan as well as learn to use intuitive and mindful eating strategies. Erin currently serves as the Eating Disorder Specialist in the Counseling Center, and has been at Baylor since January 2017. She provides individual and group therapy to Baylor students with eating disorders, and assists in coordinating treatment among the Eating Disorders Care Team members. Erin has over a decade of experience treating eating disorders. Prior to Baylor, she held clinical and leadership positions in several nationally-known eating disorder treatment centers. Erin specializes in the treatment of eating disorders and anxiety disorders, and has extensive experience treating trauma. She has lectured nationally on the subject of eating disorders and co-occurring anxiety disorders. Erin is a Certified Eating Disorder Specialist (CEDS) through the International Association of Eating Disorders Professionals (IAEDP). She is a member of IAEDP and the Academy for Eating Disorders. Dr. Myers earned a Bachelor of Science degree with honors from Dallas Baptist University, completed his Medical Doctorate at the University of Texas Health Science Center in San Antonio, and had his residency training in Psychiatry at the University of Arkansas for Medical Sciences. He is Board Certified in Psychiatry by the American Board of Psychiatry and Neurology.